who has hand to his mouth. Arianna wearing her new hat from my parents. Arianna sleeping next to me just now while Angie takes a walk. Arianna reaches out for mommy. Arianna loves holding and chewing on her blanket. The kids about to open a package from the grandparents. Waking Arianna up in the morning. We finally took an updated family portrait. 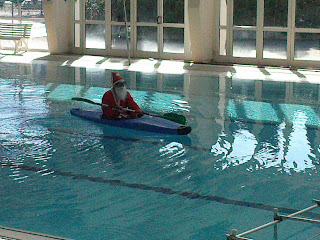 Santa showed up at swimming class. 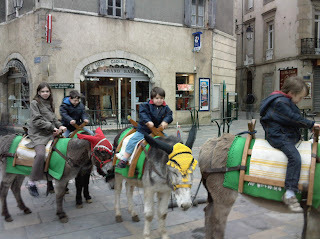 The kids going for a donkey ride. Arianna gets herself trapped in bed.